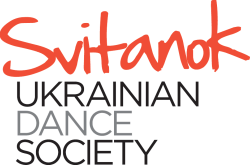 Would you like to join the Svitanok Ukrainian Dance Ensemble? ﻿We welcome and encourage new dancers to come out and experience a practice! Rehearsals take place twice a week at The School of Dance in Ottawa. The Ensemble has performed at different locations in Canada and abroad, and it continues to proudly represent Ottawa's Ukrainian community and dance community. For more information about becoming a member, send us a message.